I have failed you, dearest blog readers. I was too impatient to begin eating this meal, so I didn't take any pictures. I also didn't think it would be blog-worthy until I dug in. 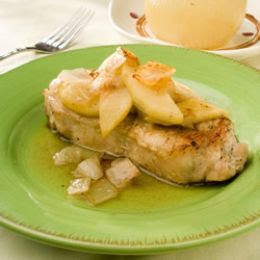 I'm not the biggest fan of pork chops, but this is a definite WIN recipe- cheap, easy, very little mess, and definitely delicious. I used pink lady apples, but any tart apples would work fine. So, here's a picture I found online of a similar recipe. I served mine with asparagus, of course, which I sauteed in margarine with pepper, garlic powder, and some crushed almonds for about 7 minutes. Core and cut up two apples into slices. I left the skins on, but you can remove them if you want. Put them in a 9x9 casserole dish and sprinkle generously with cinnamon and brown sugar. In a small skillet, brown 2 pork chops in butter, one minute per side. Place the chops in the casserole dish with the apples, making sure some of the apples are on top of the chops. Place several small dabs of butter or margarine in the dish. Salt and pepper to taste. Bake in the oven for about an hour, or until cooked through.